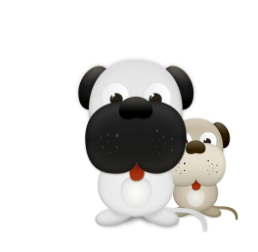 Neutering Trips, Dog rescue and re homing in Sussex, Surrey, Cambridgshire, Bedfordshire, Huntingdonshire - www.desperategreekiesdogrescue.com, Dog rescue. We sterilise as many animals as we can afford to, even the smallest donation will help enormously. Could you give just a couple of pounds to help stop suffering? Most of us waste more than this every day! Please help us sterilise as many as possible in 2019. With your support another 373 female dogs and 75 cats sterilised in 2018. January/ February 2018 70 dogs sterilised. March/April/May 2018 90 dogs sterilised. 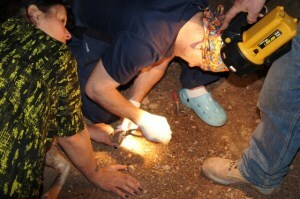 15 cats sterilised. June/July 2018 80 dogs sterilised. 30 cats sterilised. August/Sept 2018 50 dogs sterilised. 20 cats sterilised. Oct/Nov/Dec 2018 83 dogs sterilised. 10 cats sterilised. With your support another 384 female dogs and 102 cats sterilised in 2017. January 2017 53 dogs sterilised. 3 cats sterilised. ​February 2017 56 dogs sterilised. 5 cats sterilised. March/ April/ May 2017 64 dogs sterilised. 2 cat sterilised. June/July/August 2017 53 dogs sterilised. 42 cats sterilised. ​Sept/Oct 88 dogs Sterilised. 50 cats sterilised. With your support another 222 female dogs and 41 cats sterilised in 2016. January 2016 5 dogs sterilised. ​February/ March 2016 52 dogs sterilised. 21 cats sterilised. ​April /May/June 2016 15 dogs sterilised. 11 cats sterilised. July/Aug/Sept/Oct/Nov/Dec 2016 150 dogs sterilised. 9 cats sterilised. ​Thank you all so so much. 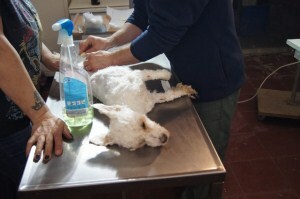 January/February/ March 2015 117 dogs sterilised. 45 cats sterilised. April 2015 20 dogs and 22 cats sterilised. May 2015 30 dogs sterilised. 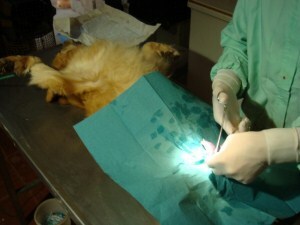 2 cats sterilised. June/ July 2015 46 dogs sterilised. 12 cats sterilised. August 2015 49 dogs sterilised. 2 cats sterilised. September 2015 15 dogs sterilised. 10 cats sterilised. October 2015 13 dogs sterilised. 2 cats sterilised. November 2015 12 dogs sterilised. 6 cats sterilised. ​December 2105 10 dogs sterilised. 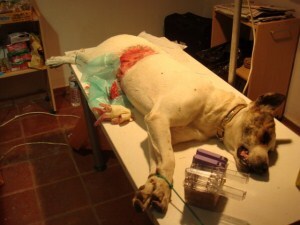 Above and below are some of the many pictures of sterilised animals. Please chip in no matter how small your gift. Make a huge difference. We are currently trying to fund some strays to be sterilised with local vets until we can arrange our next neutering trip, see just a few of the photo's of sterilised dogs above. 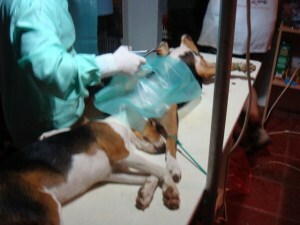 Hundreds have been sterilised now as we never give up trying and we must not! NEXT NEUTERING TRIP IS NOW PENDING.. April 2014... completed. Neutering trip- April 2013... completed. 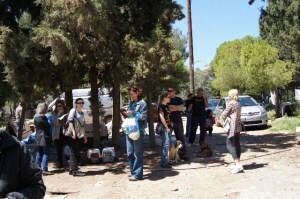 Once, sometimes twice a year we try to arrange for vets to attend a shelter in Greece for 3 days to neuter as many cats and dogs as possible. We were very lucky to have been able to have our fantastic vets at the shelter AGAIN in September 2012, another 120 animals sterilised! April 2012 neutering campaign 128 animals neutered, we now start again to raise funds for our next neutering trip.. and so we strive to continue.... the suffering is so great, we have to keep neutering, please help us to alleviate the cruelty. Below is a gallery of other photos from the trip. 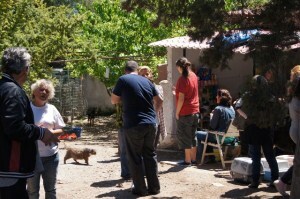 Lots of people came with there animals, we were all kept very busy.our last day of work finished at 2.30am Most of the animals were female dogs. Bella the shelter sheep having her feet trimmed, we were so busy we were doing this at midnight by torchlight! The video below shows Bella having her fleece cut off for summer. We arrange this for Bella every year and also try to keep her feet trimmed. Dr. Petrisor Stefan, with word now spreading we had more street/stray animals brought to the shelter this time and at the end of the third day 110 animals had been neutered 65 were street/stray animals stopping hundreds of puppies/kittens being born to a life of misery, 2 tumours removed and 1 front leg amputated, poor dog had been hit very badly by a car and her leg couldn't be saved. 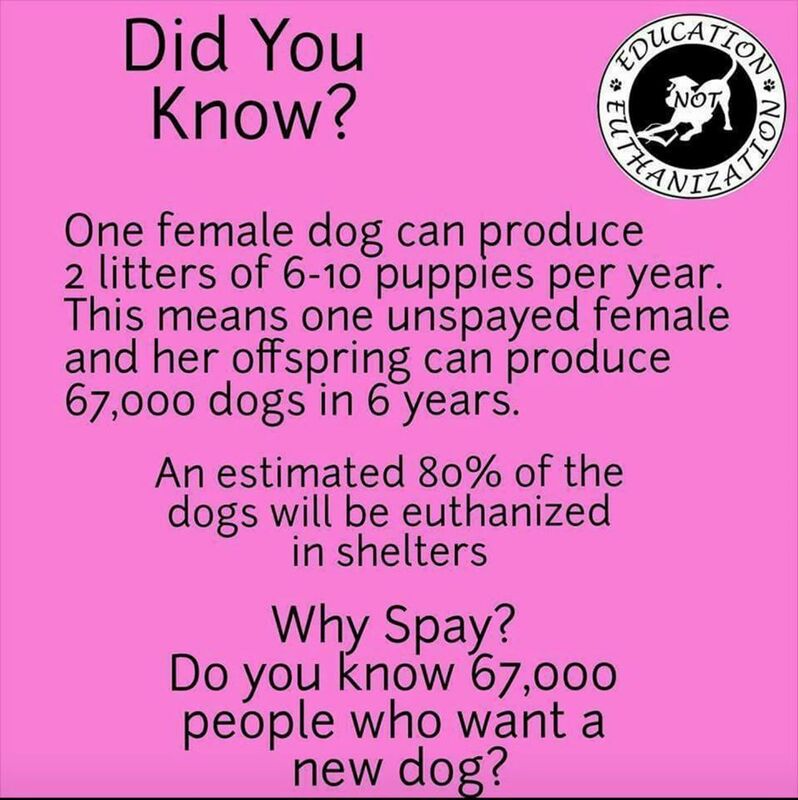 This is why these neutering campaigns are so vital. Please support us and help fund the next neutering campaign, we are already arranging this. Vets Aurelian and Petrisor working tirelessly. 2009 150 animals sterilised, again in 2010 we managed to fund a neutering trip and our wonderful vets saved so many animals from suffering by treating wounds, removing a growth, amputating a leg and neutering 105 dogs/cats on this most recent trip, this means countless puppies/kittens will not be born to suffer. 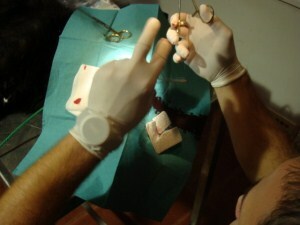 The vets returned again in 2010 and sterilised another 130 animals. This work is absouloutely vital in the battle to help stop some of the suffering. Please continue to support us. 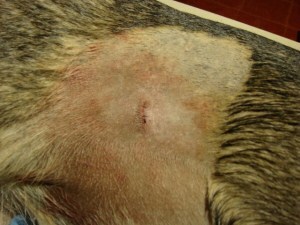 Shown below is the amazing flank spay, this Technic leaves such a small wound that is barely detectable just days later. 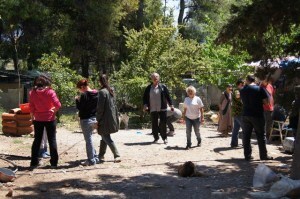 Un-neutered dogs and cats are the main reason for so many strays in Greece. Our vets work around the clock spaying as many animals as possible. There are hundreds of animals that need our help and the vets work tirelessly to ensure all the animals are seen and treated. Please help us continue with these essential visits. 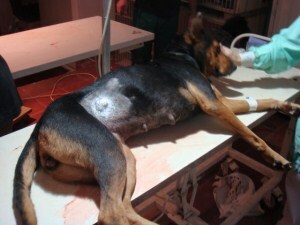 We desperately need funds to send the vets out. If you can assist us in any way we would love to hear from you. We would like to thank our wonderful vets Petrisor (left) and Aurelian for all their help and support with the Desperate Greekies.